ALL CCFR PERSONNEL: We now have the ability to receive calls via text messaging and through an app on smartphones. Click here for additional information. ALL CCFR PERSONNEL: The CCFR Android App has been updated. Click here for additional information. Congratulations to Firefighter/Paramedic Robert Gregory for passing his Engineer Examination and being promoted to Engineer/Paramedic. 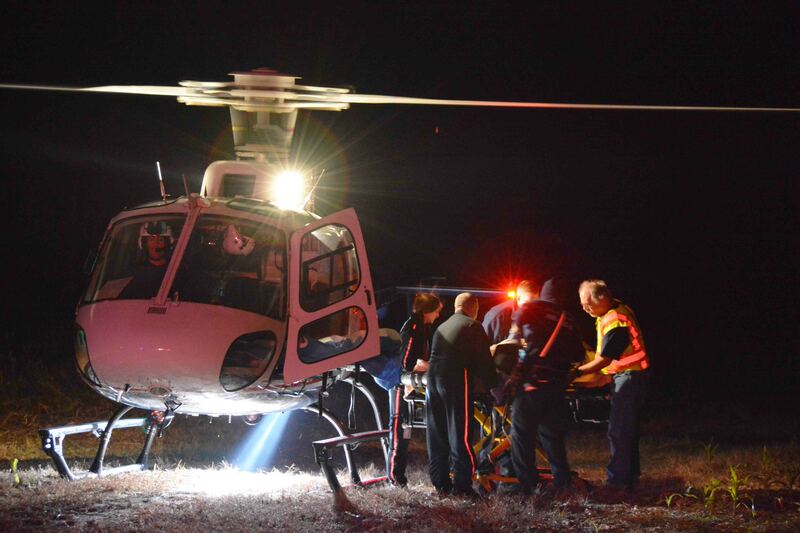 A 46 year old man received life threatening head injuries in a single car crash in the 6000 block of Sidneys Road, Monday evening 28-October. At 21:00, 9-1-1 received multiple calls reporting an overturned vehicle with a person being ejected. Engine 19 and Medic 19 arrived to find the small car overturned in the roadway, blocking traffic. Click here for more information. An adult female died as a result injuries she received after being struck by a SUV on Sidneys Road near the intersection of Chestnut Road. The accident was reported at 06:10, Monday morning 28-October. The northbound Chevrolet Tahoe had just left the Pak-A-Sac convenience store near this location. Click here for more information. A 19 year old Williams woman received multiple traumatic injuries in a single car crash on Beulah Road north of Lodge Hwy. Sunday evening 27-October. 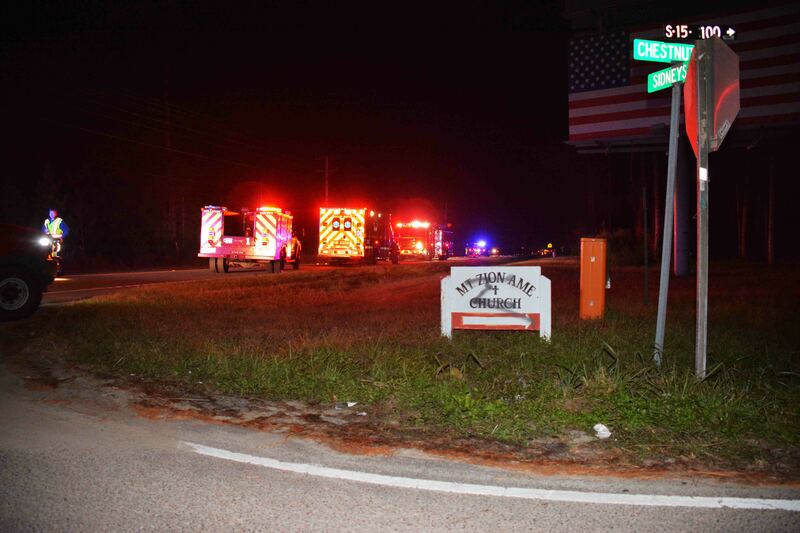 The accident was reported at 19:38 when a passing motorist found the young lady near the wrecked pickup truck. Click here for more information. 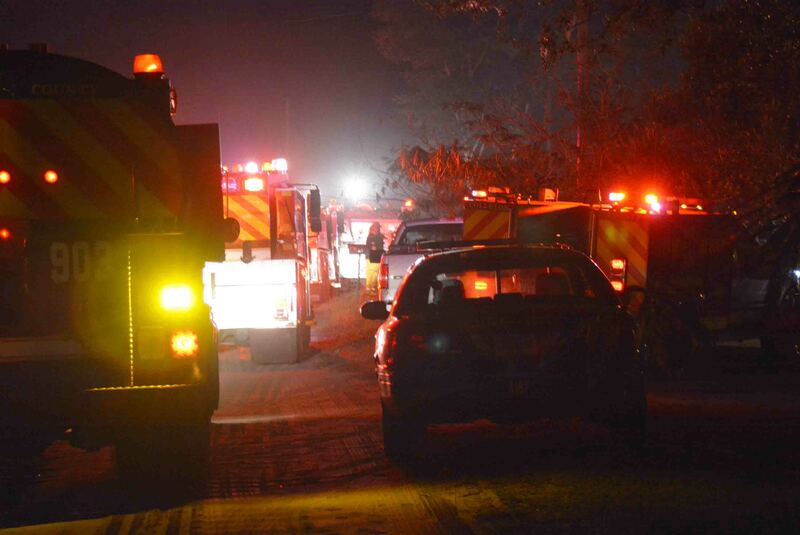 At 01:00 Sunday morning 27-October, Fire-Rescue was dispatched to a structure fire at 344 Candlelight Drive. Callers reported flames coming from the roof and that all occupants had safely exited the building. Engine 19 arrived to find the doublewide mobile home with flames extending across the entire roof and fire venting from several windows on the B/C corner. Click here for more information. 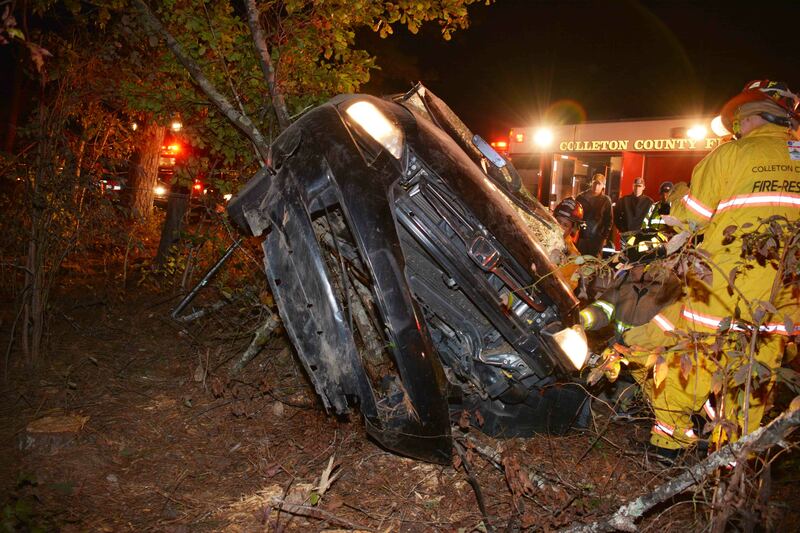 A Ruffin woman received non-life threatening traumatic injuries in a single car MVC on Hudson Mill Road at Penny Creek Drive Sunday morning 27-October at 00:06. 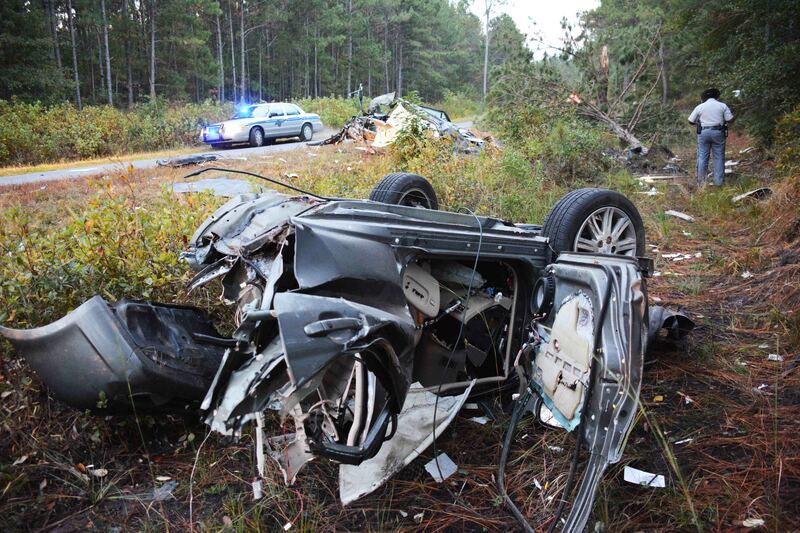 The westbound Honda Accord left the roadway, entered the eastbound ditch, then rolled over several times before coming to rest against several trees. Click here for more information. An adult female suffered a critical life threatening emergency at a residence on Mable Lane Saturday evening, 26-October at 19:58. Firefighter-Paramedics on Medic 19 began treating the woman at the home and requested an additional Medic unit to respond. 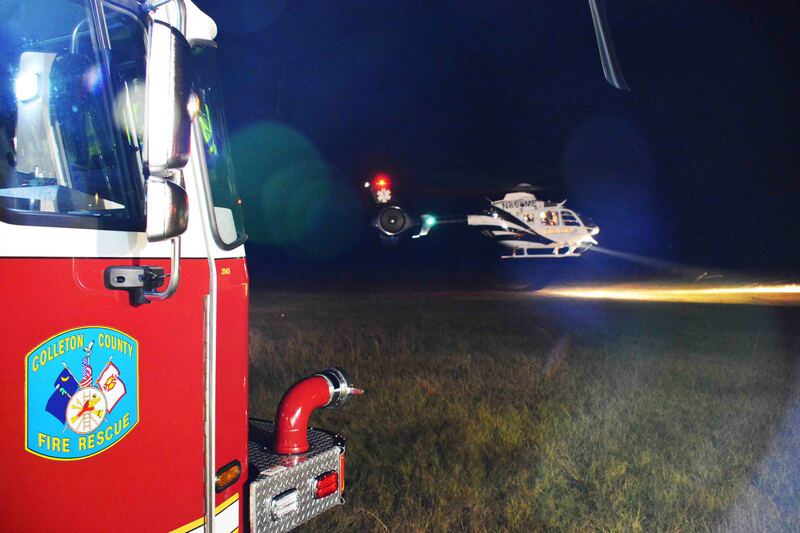 A medical helicopter was also called to transport the patient to a specialty center in Charleston. Click here for more information. 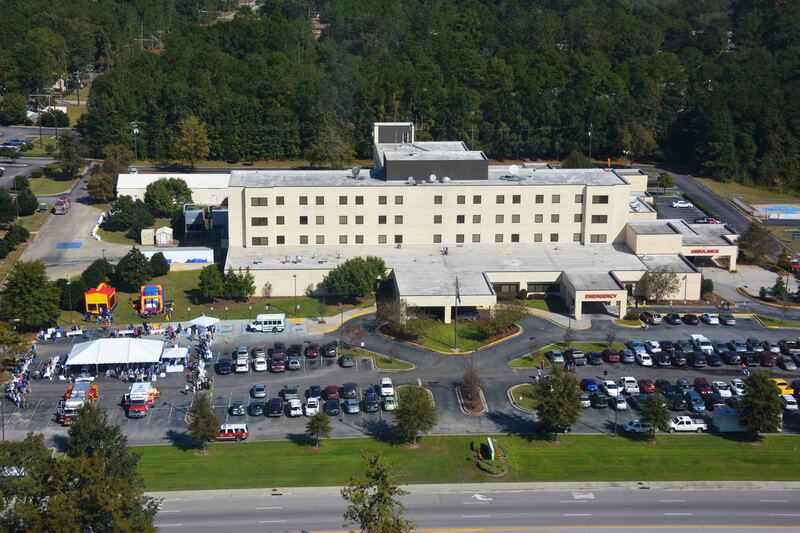 Colleton Medical Center celebrated its 30th Birthday with an event on the hospital campus, Saturday morning 26-October. Local dignitaries as well as many hospital staffers and the public attended. The program began at 10:00 in the front parking lot with a welcome from Hospital CEO Bradley Griffin followed by an invocation from Rev. Zane Brown. Click here for more information. 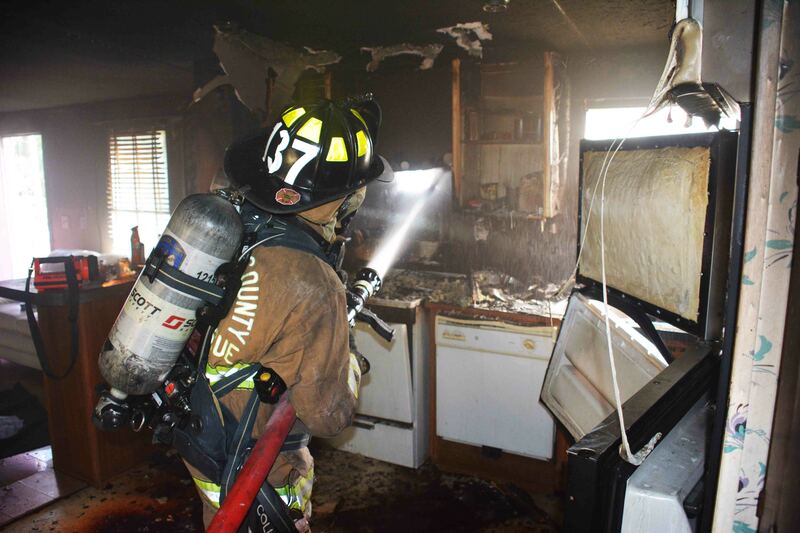 Firefighters saved a Wesley Grove home and rescued a canine, after a fire caused heavy damage to the kitchen. 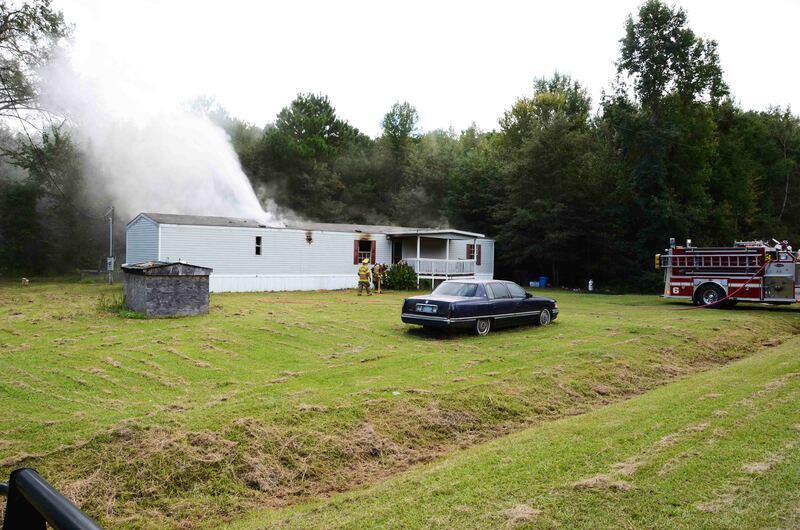 9-1-1 was notified of smoke coming from a residence at 55 Saw Dust Drive at 14:17, Friday afternoon 25-October. Engine 9 arrived to find smoke coming from the singlewide mobile home. Click here for more information. A 53 year old man received multiple traumatic injuries following a single vehicle MVC in the 1600 block of Wolfe Creek Road Friday morning 25-October. A passing motorist located the accident on the remote rural road. The man attempted to free the driver before calling 9-1-1 at 01:47. Click here for more information. 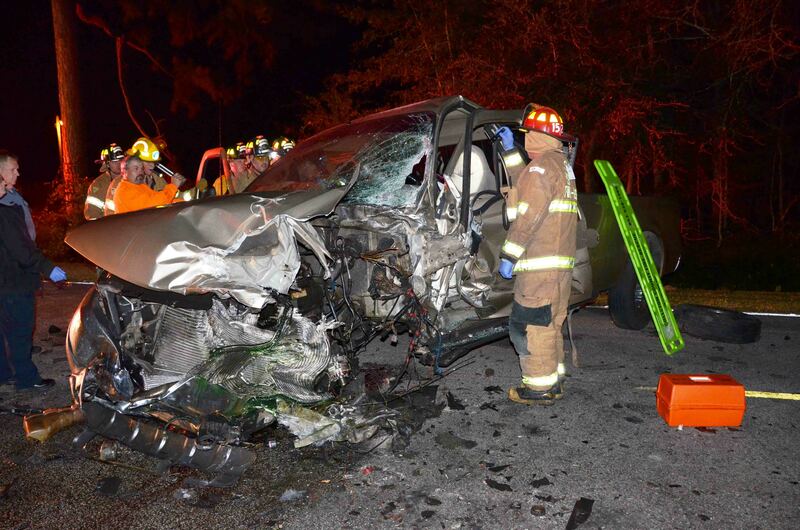 A 62 year old man suffered multiple traumatic injuries after his pickup truck collided head-on with a tractor trailer in the 17600 block of Sniders Highway near Dopson Road. A BOLO had just been issued to Sheriff’s Deputies over the radio for a vehicle that was driving erratically matching the description of the pickup truck. Click here for more information. A 54 year old man died from injuries sustained in a high speed single car MVC on Can City Road Monday morning 21-October. The Toyota Avalon was northbound on Can City Road when it failed to negotiate a curve near the intersection with Rolling Brook Lane. 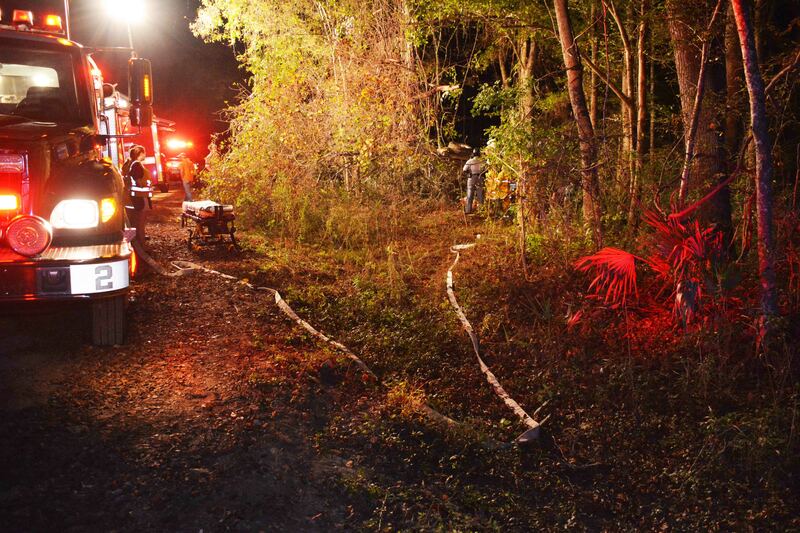 The car entered the ditch, struck a culvert pipe and became airborne. Click here for more information. 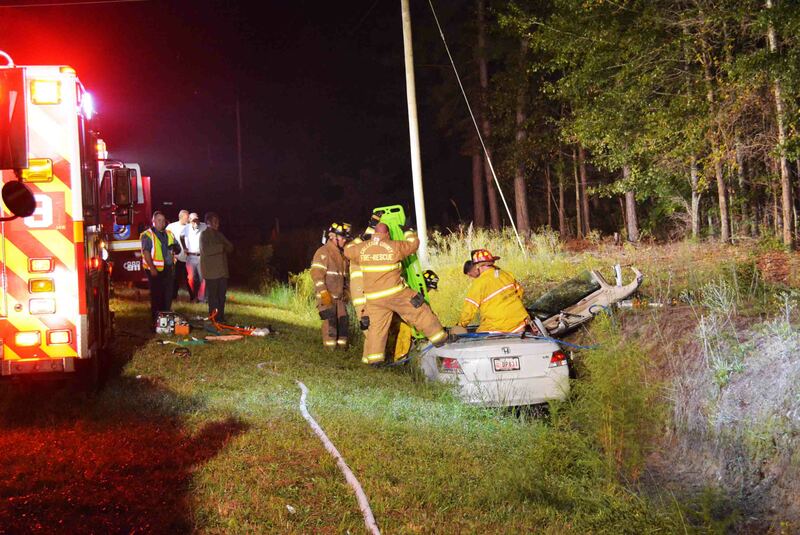 A 22 year old Hanahan man received multiple traumatic injuries in a single vehicle crash on a hunting club road off of Parkers Ferry Road Saturday evening 19-October. 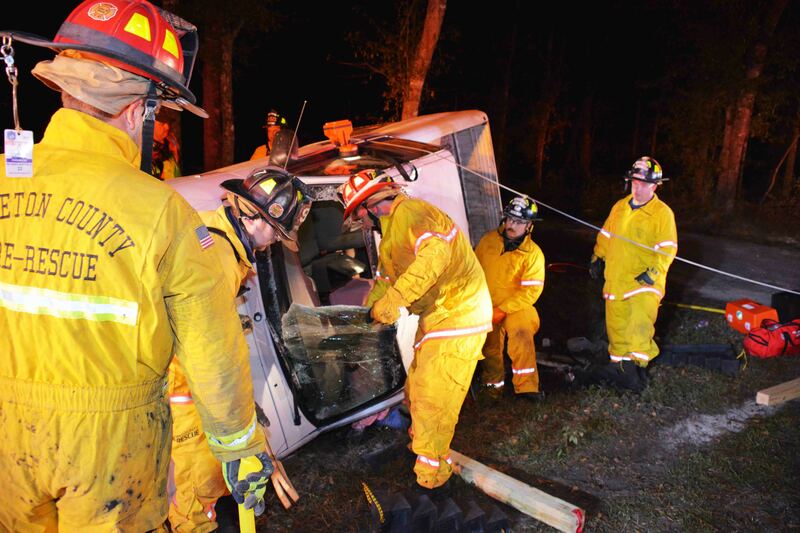 The pickup truck was traveling at a high rate of speed and left the narrow dirt road, entering the woods before it flipped over several times. Click here for additional information. 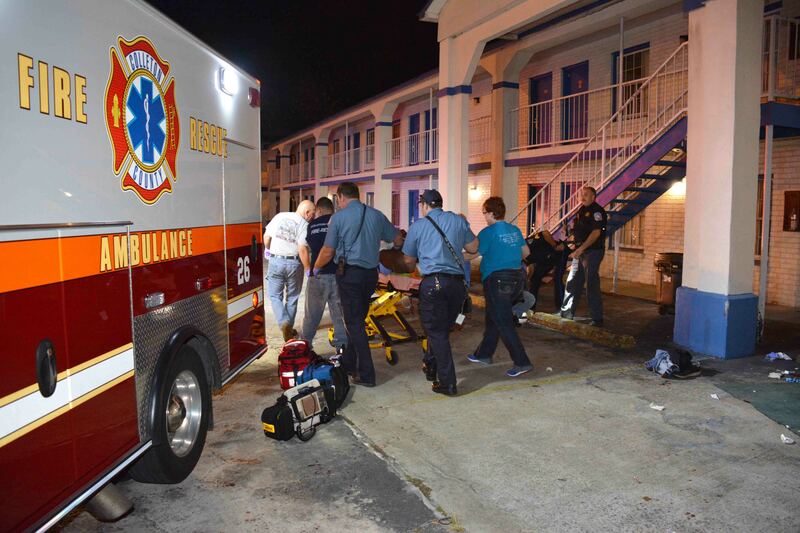 An adult male received multiple traumatic injuries, including severe head injuries, in an altercation. Firefighter-Paramedics were called to the 12000 block of Bells Hwy by Law Enforcement. Medic 18 arrived a short time later and began treating the man. 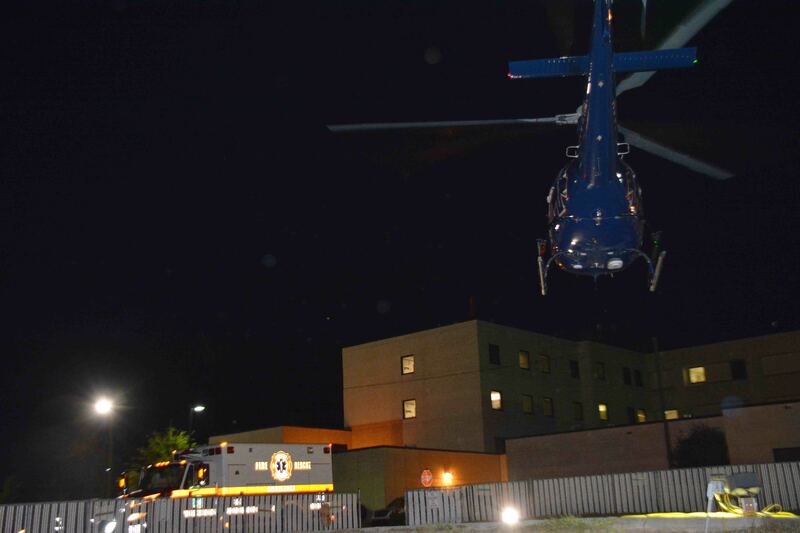 They requested the availability of a medical helicopter, then began transporting the patient emergent toward Colleton Medical Center. Click here for more information. A Ruffin family was displaced following a fire in their residence at 471 Paps Place off of Red Root Road, Monday morning 14-October at 00:54. Engine 18 arrived to find the one story wood frame structure approximately 65% involved, with flames through the roof on the south side of the building. All of the occupants had safely exited the building prior to Fire-Rescue’s arrival. Click here for more information. A 30 year old man received multiple gunshot wounds during an incident at the Sunset Motel, located at 1577 Bells Highway. The shooting occurred Saturday evening 12-October at 20:29. Law Enforcement Officers found the man walking in the parking lot, bleeding profusely. He received wounds to the neck, head, chest and arm. Click here for more information. 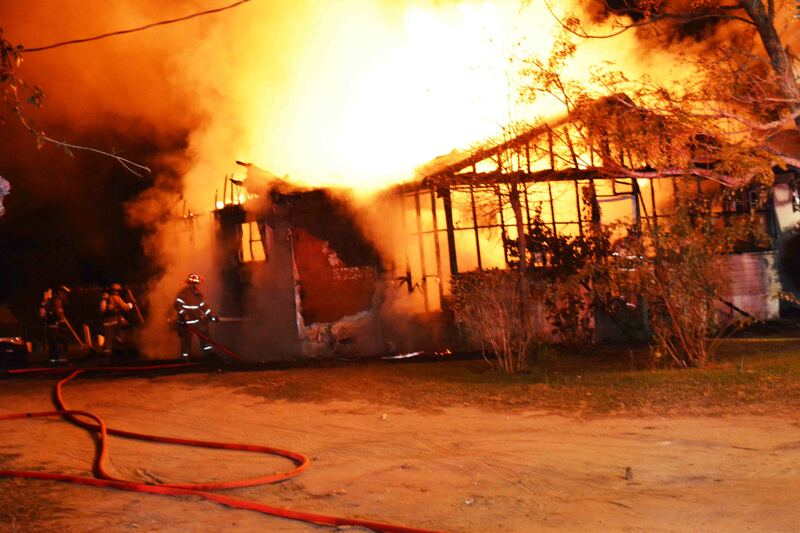 Colleton County Fire-Rescue will be holding Pre-Employment Testing from November 19 - 21, 2013. If you are interested in applying for a full-time or part-time position, please visit https://jobs.scworks.org/ and search for the keyword "Firefighter" and the zip code "29488" in the "Search for a Job" box. In-state applicants can apply at any SC Works Employment Offices. Applications should be accompanied by a 10-year driving history. Questions or attachments can be sent to Ms. Haynes at (843) 694-7238 or lhaynes@lowcountrycog.org . Colleton County, in conjunction with the Fire-Rescue Commission is offering employees and Volunteer Firefighters the opportunity to obtain a Flu Shot at Fire-Rescue Headquarters at 113 Mabel T. Willis Blvd on Monday, October 14th from 17:30 to 18:30 and on Thursday, October 17th from 17:30 to 18:30. The shots will be administered by a nurse at no cost to the employee/volunteer firefighter. 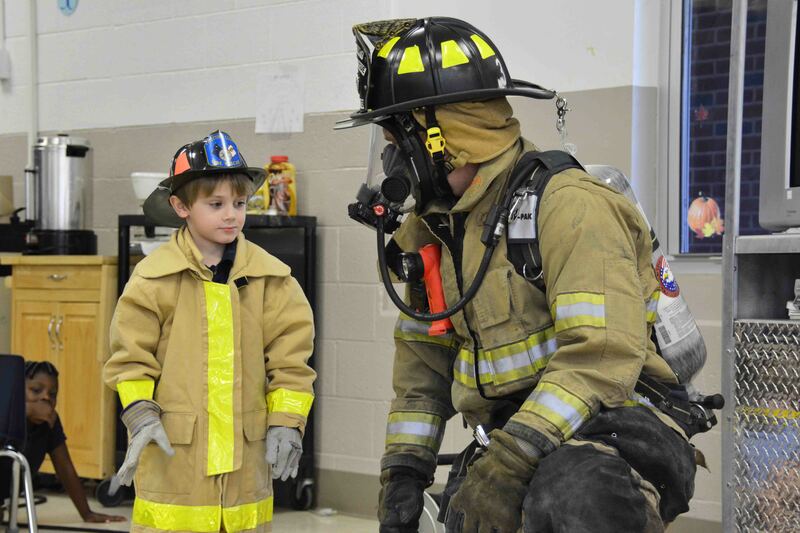 Fire-Rescue began the month long Fire Prevention and Life Safety Education in the schools on 02-October. This year’s activities began at Black Street Early Development Center with the K-4 and K-5 programs. The program actually runs throughout the year with presentations and demonstrations for all age groups... click here for more information. 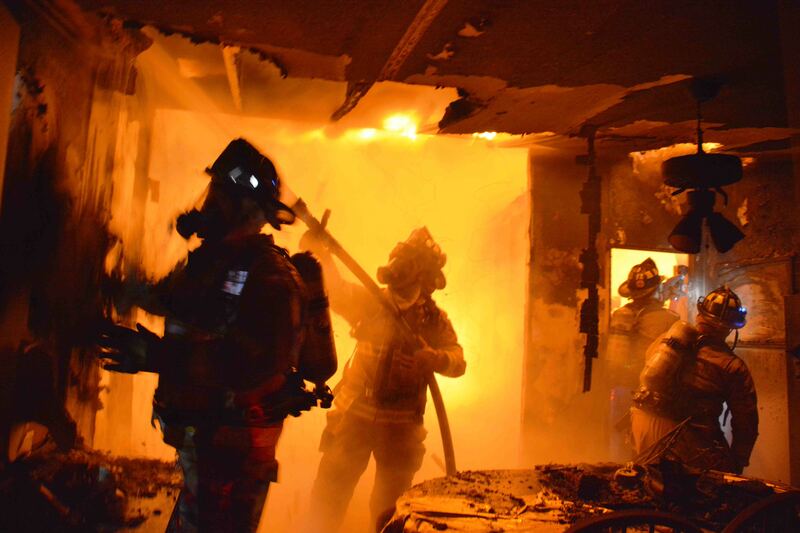 Firefighters saved a Green Pond home after a fire heavily damaged the kitchen and living room Sunday morning 06-October. At 10:53, 9-1-1 was notified of smoke coming from the home at 571 Turkey Hill Lane. Engine 6 arrived minutes later reporting flames coming from the roof in the center of the singlewide mobile home. Click here for more information. The Sheriff’s Office will have one additional Pal800 Training Class on Wednesday afternoon, 09-October starting at 14:00. An adult female suffered non-life threatening traumatic injuries in a single car crash near the 1600 block of Rhode Drive, Thursday morning 03-October at 00:25. The eastbound car left the roadway and entered a deep ditch. The front of the vehicle impacted the side of the ditch and the car came to rest on its wheels. All of the doors were blocked by the ditch banks. Click here for more information. A suspected electrical problem caused a fire underneath a doublewide mobile home Wednesday evening 2-October. At 20:55, 9-1-1 was notified of a house on fire at 364 Mars Oldfield Road. Engine 36 arrived to find fire under the house near the frame rail. The homeowner had used a pot of water to knock down some of the fire prior to firefighter’s arrival. Click here for more information. 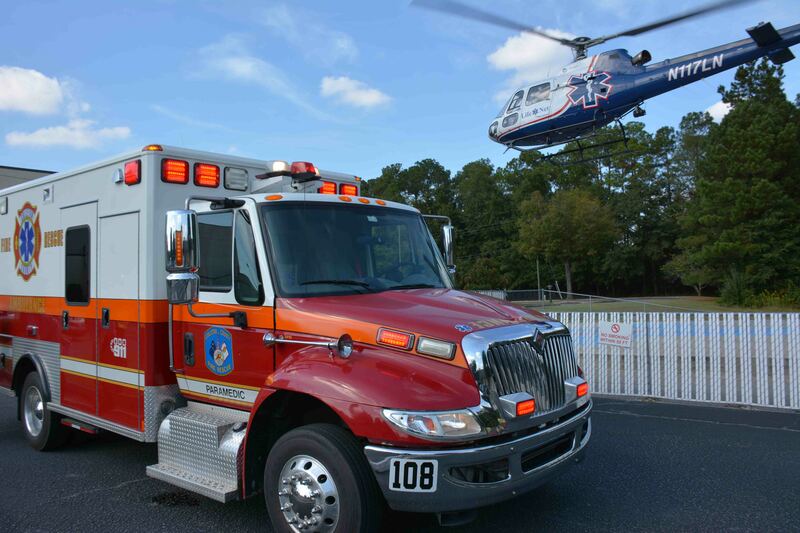 Colleton County will host an Emergency Medical Technician course in January 2014. Click here for more information. 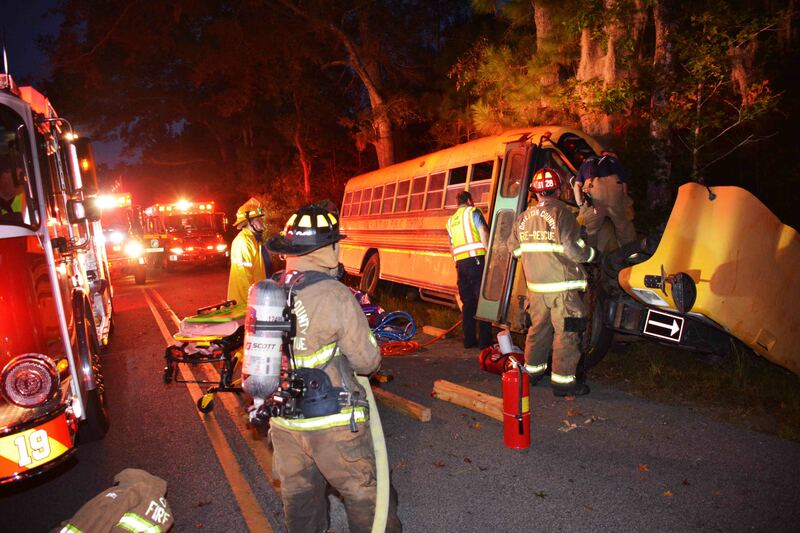 An adult female was severely injured in a School Bus accident Tuesday morning 01-October in the 2600 block of Pearce Road north of Cottageville. Fire-Rescue was notified of the incident at 06:08. Apparently the northbound bus crossed into the southbound lane, entered the ditch and struck several trees. Click here for additional information.